Welcome to T3's full, starred, Samsung Galaxy Note 9 review. This is the culmination of my weeks-long reviewing process that has seen me analyse every part of the flagship handset, all in order to see if it is the best Android phone in the world, as well as if it does enough to enter our prestigious best smartphone buying guide. This full Samsung Note 9 review, therefore, covers every aspect of the handset, and is broken down into the core scoring sections of design and build quality, hardware and screen, camera and S Pen, battery and audio, as well as Bixby AI assistant, features and OS. So, to find out if the Note 9 is better than Samsung's other 2018 flagship phones, the Galaxy S9 and Galaxy S9 Plus, as well as if it can fend off fierce challenges from rival devices like the Huawei Mate 20 Pro, read on. First up, though, I'll cover the Samsung Galaxy Note 9's price, models, and availability. The Samsung Galaxy Note 9 price is £899 ($1,000) for the entry level model, and £1,099 ($1,250) for the top spec model. The two models are specced identically aside from the included RAM and internal storage space, with the base model packing 6GB of RAM and 128GB of storage space, and the top spec model coming with 8GB of RAM and 512GB of storage space. The Samsung Galaxy Note 9 is available in three colourways, Midnight Black, Ocean Blue (the model reviewed), and Lavendar Purple. The new Galaxy Note 9 is available to buy from a variety of retailers, including Samsung's official online store, John Lewis, Amazon, Currys PC World, Carphone Warehouse, and Selfridges. Samsung are currently running a promotion where you can trade in certain phones to get a discount on ordering the Note 9. Example price deductions range from -£400 for a Galaxy Note 8 64GB, -£350 for a iPhone 7 128GB, and -£100 for a Pixel 2 128GB. Many more phones are included, too, from a range of makers. The Samsung Galaxy Note 9's microSD slot supports cards up to 512GB in size. Open the Samsung Galaxy Note 9 box and the first thing you notice when lifting the phone out of its internal cradle is just how dense the device feels in the hand. Despite its slimline design, with its total dimensions measuring in at 161.9 x 76.4 x 8.8 mm, the Note 9 in no way feels light, plasticky or hollow, which a few other flagships have done in 2018 with displeasing results. Look at the spec sheet, though, and that premium feel is backed up by a substantial 201-gram weight, which even outweighs technical build-quality leaders like the HTC U12 Plus, which itself felt very premium in the hand. The extra weight could very well come courtesy of the device's enlarged 4,000 mAh battery, which is far larger in capacity than its predecessor's, which was just 3,300 mAh. This combination of thinness and density means the Note 9 just exudes quality in terms of feel, while its dripping-with-luxe 6.4-inch Infinity Display (more on that tomorrow) completes the package – rival makers' best efforts at a premium look and feel are blown away by the new Galaxy Note 9. Yes, the Note 9 does look and feel similar to the Samsung Galaxy Note 8, and if you put the phones side-by-side screen up then they are nearly identical to look at. However, when you get close-up, and especially when you clock the re-positioned fingerprint reader on the backplate, which is now positioned below the camera lenses rather than to their right, the small improvements Samsung has made on this new Note become more evident. In terms of physical layout of the buttons and stylus port, which now houses the new and improved version of Samsung's S Pen, it is business as usual. Same, too, with the device's headphone jack (yes, Samsung continues to buck the trend on the wireless only audio push) and SIM card / microSD card slot, which remains on the top left of the phone. In terms of frame, the Note 9 features a brushed metal exterior frame that merges near-seamlessly with the phone's Gorilla Glass screen and backplate. This feels smooth and cool under the skin, and is only interrupted by the Note 9's various ports and cooling / audio vents. Lastly, an additional point to note about the Note 9's build quality is that the device is also IP68 water and dust resistant, which for a device that costs nearly £900 in its base configuration are qualities that are definitely most welcome. In no way should this device like this ever come into contact with water, or large piles of dust, but it feels good to know that the phone has this official certification in its locker. Despite all those stories about rival parts makers snapping at Samsung's heels in the construction of AMOLED displays, the 6.4-inch Super AMOLED installed on the Note 9 reminds you, if anything, that those competitors are still streets behind the South Korean maker. The 18:5:9 Infinity Display on the Note 9 is, simply put, a stone-cold stunner and the best smartphone screen in the world right now. Its super size, despite the hate spewed by large phone naysayers, is a thing of iPhone-beating beauty, with its rich and vibrant colour reproduction, strong brightness, high-resolution (1,440 x 2,960, 516 ppi) picture sharpness, HDR support, and lush curved glass absolutely destroying the competition. The Note 9's screen's fidelity, vibrancy, and real-estate are simply unparalleled. I thought the screen on last year's Note 8 was very strong, and the unit installed on the Samsung Galaxy S9 Plus equally stunning, but the slightly taller panel fixed into the Note 9 is – marginally – the best of the lot. Its fidelity, vibrancy, and real-estate are simply unparalleled. From streaming HDR movies from Netflix, to enjoying a couple of rounds of intense hand-to-hand combat in Dragon Ball Legends, to reading the fine, fine content on T3.com, and onto taking notes and taking some time out to pen some epic illustrations with the Note 9's S Pen digital stylus, this phone's screen makes it an absolute pleasure. 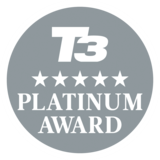 In terms of hardware, the Note 9 is right up there in terms of 2018's flagship Android phones, and definitely at the same level of Samsung's own Samsung Galaxy S9 and S9 Plus flagships, which both vacuumed up 5 stars from T3.com when we reviewed it. The new entry-level spec Galaxy Note comes packing a Qualcomm Snapdragon 845 processor, 128GB of storage space (a 512GB version costs more), 6GB of RAM (this is increased to 8GB on the 512GB storage model), and a 4,000 mAh battery. Running the phone through GeekBench 4, as you would expect, it returned very healthy scores, notching 3,750 in a single-core test, and 9,016 in multi-core. These are scores that, OnePlus 6 aside, are top of the Android tree. And, maybe with the extra 2GB of RAM installed on the higher-spec Note 9, the absolute king. The Note 9 cements the series' reputation as a technical leader in the smartphone field. In terms of RAM, CPU, and storage this compares either identically or very, very similarly to many of this year's best flagship phones, including the Sony Xperia XZ2, OnePlus 6, HTC U12 Plus, and LG G7 ThinQ, while arguably beating last year's iPhone X quite comfortably on paper. Last year's Galaxy Note 8 was a similar technical powerhouse, as you would expect from a phone that has a heritage of technical excellence (maybe aside from the Galaxy Note 7 and its battery issues), and while you could argue that the Note 9 doesn't deliver a spec that reaches boldly into the future, it does deliver an excellent all-round package. As you would expect from such a flagship-grade internal hardware suite, using the Note 9 is a rapid, fluid experience: I experienced zero slow-down or lag while opening and using apps, playing games, switching usage modes (such as when using the S Pen), downloading content and browsing the internet. To be honest that level of performance should absolutely to be expected at £899, though. Overall, then, the Note 9 is a technical juggernaut in terms of screen and internal hardware, with the device cementing the series' reputation as a technical leader in the smartphone field. The Note 9 packs a dual 12MP rear camera setup, with the dual-aperture technology that debuted in the S9 Plus. If you want to have a good idea of how the Note 9's camera system performs you should look to the Galaxy S9, which it has inherited its dual-aperture rear camera features from. The Note 9 features a brace of 12MP rear camera lenses and a single 8MP front camera lens. The dual-aperture rear setup allows the Note 9 to switch between an f/1.5 aperture for low-light photography, and then a f/2.4 aperture for regular lighting conditions, granting the phone excellent adaptability when shooting, especially when conditions get overcast or dark, or when the light is flat. The secondary rear camera on the back of the Note 9 also comes packing a 2x optical zoom, allowing for some pretty decent zoomed in, telephoto-style shots. Both rear cameras come packing optical image stabilisation, too, which I find most useful when pulling out the phone to take quick snapshots. Moving round to the front of the Note 9, the 8MP front camera now comes loaded with a first for the Note series, a front-facing camera with autofocus, which if anything helps to exploit the other major new innovation this year, the Bluetooth-packing S Pen digital stylus (more on that soon). In terms of shooting modes it is business as usual for Samsung, with a dump truck-load of shooting options available, including Auto, Pro, Panorama, Live Focus, Super Slow Motion (960 fps at 720p) and AR Emoji/Selfie. There's also a new scene-optimiser built-in, too, which can automatically adjust images in terms of colours, sharpness, and contrast. Auto mode lets you just point and shoot, while Pro mode allows detailed and complex shooting options to be selected. AR Emoji, which was such a big play on the Samsung Galaxy S9 series, is back on the Note 9 but now with a few extra avatar customisation options. As you can see from the image below, creating your AR Emoji with the Note 9's camera system is super easy, with you simply plonking your face in a capture circle, then sitting back for 5 seconds while the system builds your virtual you. As with the S9, though, the results from my reviewing experience remain sketchy and a little too generic that what I would ideally want. For some reason the system kept making me look like David Duchovny, which while not a bad thing, did seem to highlight the limitations of the system. I also got a few colleagues here at T3 to create avatars, too, and they were equally sketchy as well. At least the process is fast, though, and when you've created your avatar they are then added to your emoji list in the Note 9's menu system meaning you can easily call upon them and insert them into messages. AR Emoji mode remains easy and fun to use. However, its accuracy is questionably similar to on the Galaxy S9. Lastly, while the Note 9 offers many video recording options in terms of resolution and frame rate, with the phone topping out at 4K, 60fps, it doesn't support HDR recording like, say, the Sony Xperia XZ2. It's super slow-motion recording capability, too, remains impressive, with footage capturable at 960fps at a 720p resolution, that is also beaten by the XZ2's 960fps at 1080p recording capabilities. Overall, though, I think it fair to say the Note 9 is a picture-taking, video-recording powerhouse, offering a plethora of shooting options and modes that will appeal to phone and camera enthusiasts in equal measure. The new Bluetooth-packing S Pen digital stylus takes the Note's functionality to a new, higher level. One of the unique weapons that the Note series has had in its armoury for years is its inclusion of a stylus. And in the Note 9, Samsung has taken the stylus to a higher new level, that markedly separates it even from last year's Galaxy Note 8. This time round the stylus has in-built Bluetooth, which allows for some pretty darn neat shortcuts, including the ability to open the camera app and take pictures remotely (great for selfies and wide-selfies; see below image) from up to 30 feet away. The first picture I took remotely with the Note 9's new Bluetooth-packing S Pen digital stylus. You can flip the camera remotely, too, and also start and stop recording video. You can also use the S Pen to start and stop audio tracks, with me easily able to pause the Guardian Football Weekly podcast remotely, and also browse through photos and PowerPoint slides. All these actions are enacted by short, long or double presses of the S Pen's button. The S Pen does need to be charged, which is done when housed internally in the phone. However, only 40 seconds of charge time will bank you around 30 minutes of standby battery, so I can't envisage its tiny internal battery ever running out of juice. Extract the S Pen and you can quickly write on the screen. Or you can create hand-written notes and illustrations by creating a note from the S Pen's menu wheel. I also found its accuracy when taking notes or making illustrations to be very good, and it felt natural to use in my hand, and the stylus' ability to take notes, annotate screengrabs and photos, translate foreign text (you select the words with the S Pen on the screen), and send Live Messages, were genuinely useful. I also liked the fact that the phone's yellow S Pen (I've been reviewing the Blue Ocean colourway, which comes the yellow stylus), which defaulted on the black screen with yellow ink and stood out well. Overall, then, the S Pen is far from a simple gimmick on the Note 9 and with this year's addition of a Bluetooth connection has added some neat new functionality that, believe it or not, you'll likely find yourself using on a daily or at least weekly basis. 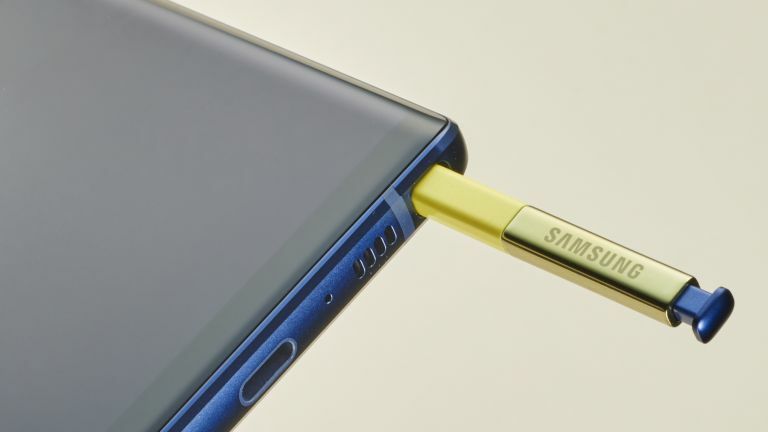 The Galaxy Note 9 retains a 3.5mm headphone jack for physical wired connections. The battery installed in last year's Samsung Galaxy Note 8 was, as we noted in our review, a "relatively small 3,300mAh" unit, which was even smaller than the battery installed on the Galaxy S8 and Galaxy S8 Plus, too. This led to a less than stellar performance return on the powerful, 6.3-inch screen equipped Note 8, which demanded power that its internal battery could really only deliver by the skin of its teeth. This was almost certainly down to the fiasco the South Korean maker had landed itself in the year before with the Note 7. So what about the Note 9? Well, the good news is that the new Galaxy Note comes packing a far more potent 4,000mAh battery, which not only feels more suitable for a super-powerful flagship phone with massive 6.4-inch Super AMOLED screen, but also far more competitive with its rival devices, too. The Huawei P20 Pro, for example, packs a 4,000mAh battery, and with rumours of the incoming Huawei Mate 20 Pro swinging an even larger battery than that, the Note 9 needed to compete in the same ball park. And, as you can see from the nearby boxout, when I ran the Note 9 through the GeekBench 4 battery test, the phone went ahead a lodged a larger score than last year's entry, raking up 5,672 points in comparison to the Note 8's 3,892. I was definitely heartened to see the Note 9 posting a much stronger score, as while it doesn't approach the battery life king, the Xiaomi Mi Max 2 (a monstrous score of 6,059), it is now firmly eating at the top table, so to speak. That said, it is important to note that GeekBench 4 returned an overall confidence score of "Medium" in terms of battery performance, though, and from my personal real-world, day-to-day usage, my gut tells me that is correct. I feel the Note 9 delivers a battery that can indeed go the "all-day" experience that is being officially touted by Samsung, and with medium mixed usage, too. But my time with the Note 9 has led me to the conclusion that unless you use the device very lightly, you'll rarely be able to comfortably extend that over into day two. The Note 9's Dolby Atmos mode, as well as customisable equaliser and profiles, are easily accessed and make a big difference. This isn't a massive issue, just as it isn't with the vast majority of smartphones, which like it or not, are still very much locked in a daily recharge cycle, be it in the evening or overnight. However, for a phone that prides itself on going big in everything, and being a productivity powerhouse, too, ideally I would want to see an even larger battery slotted in the Note 9. You do get both Fast Charging and Fast Wireless Charging capabilities in the Note 9, though, so at least refilling the phone's tank is a rapid experience. Moving on to audio credentials, the Samsung Galaxy Note 9 comes packing a set of AKG tuned stereo speakers (these are loud and offer a little more depth of sound compared to the Note 8), Dolby Atmos audio support, an in-built equalizer along with selectable UHQ upscaler and reverb-arific Concert Hall toggle, as well as the Adapt Sound system found in the S9. The Adapt Sound system, for those unfamiliar with the software, allows you to select audio profiles based on your age, or create a custom personalised profile by undertaking a hearing test (requires you to put on headphones). We've seen plenty of other handsets recently enabled with Dolby Atmos audio, including the Razer Phone, Nokia 6, iPhone X, and Huawei P20 Pro, among others, and as on them flicking the switch improves definition and richness across the soundscape, even if the file isn't encoded for Atmos. Naturally, for the full virtual surround sound effects that Atmos can deliver, with 360-degree audio capabilities, you do have to feed it compatible media. Messing around with the phone's equaliser also pays dividends when switching between, say, listening to vocal-heavy podcasts and electronic music albums, and if you have a portable DAC (check out the best DAC 2018), you can get your audiophile on with hi-res or upscaled sound, too. Overall, then, I feel the Galaxy Note 9 does enough in the battery department without really pushing the boundaries of battery life, and delivers the same high-quality, audiophile-ready sound playback as found on the S9 and a few other flagship Android phones. Samsung's AI assistant is more feature-packed than before. However, it still lags way behind Google Assistant and Apple's Siri. Bixby's back baby! And aside from still sounding like one of Bertie Wooster's chums, it returns to the Note 9 with its own dedicated, physical button still in-tact. The Note 9's Bixby button is located on the left hand side of the phone under the volume rocker, with a single press opening the AI assistant's home screen, where you can enter text commands, configure settings, and run through its tutorials, and a long press taking you directly to voice command input. Providing you enable the option, Bixby can also be raised with a "Hi, Bixby" voice command, which worked for me like 8-9 out of 10 times while on test. As before, Bixby only recognises certain accents and dialects of US English, Korean, and Mandarin Chinese, though, so you are still bang out of luck if you want to converse in another language. Samsung says Bixby is smarter and better than ever, and it does feature enhanced functionality than before, such as greater learning capabilities that allow it to tailor its responses and suggestions for you better (such as which eateries to recommend based on your past preferences). However, I found Samsung's AI assistant as patchy as ever when on test. Android 8.1 Oreo runs lickety-split on the Note 9, and Samsung's S Pen integrates with it seamlessly, too. Many requests that I felt it would be able to handle it didn't register, or if it did register them, sometimes it would do random things that weren't particularly useful. Asking, for example, "Hi Bixby, how long will it take me to get home today?" saw Bixby open The Weather Channel, while reporting "I couldn't find the specific weather condition you asked for, here's the overall weather instead". Ask Google Assistant, which is also available on the Note 9, the exact same question, and within a second a Google Maps box has opened with a time estimate to my house and a recommended route. What's more, some of the more advanced features that Samsung demonstrated at the Note 9's Galaxy Unpacked event, such as the ability for Bixby to order you a taxi are not yet supported, with Bixby returning me the error message: "Sorry, for now the function is not supported." These limitations and inconsistencies, naturally, make you lean towards using Google Assistant. However, Samsung still does not allow you to customise the Bixby button, so that you could use it to raise the more powerful, functional AI assistant. Yes, there are ways to get round this via third party apps, however that is not an ideal scenario and really I don't feel you should be dodging round something that seems like it would be pretty straightforward for Samsung to fix. Overall, I feel if you play to Bixby's strengths, such as opening core system apps, sending messages, performing music searches, setting reminders, checking the weather, and raising Samsung's own software like Samsung Health, then you'll get a pretty solid and consistent experience on Note 9. But, stray outside of them, and you'll very quickly discover Bixby remains a work in progress. Here's hoping those more advanced features get added to Bixby soon. You can really make the most out of the Note 9's Super AMOLED display by tweaking screen options. Device Maintenance remains as simple and straightforward as ever. The Note 9 runs Android 8.1 Oreo out of the box and, as you would expect from a phone coming out in the shadow of the impending Android 9 Pie launch, it runs like a bug-free dream on the Note 9. The Samsung Experience software, which replaced the crude and unpopular Samsung TouchWiz from earlier Galaxy devices, has also reached an incredibly refined level on the Note 9, with it guiding you at all times with useful hints and pointers in how you can navigate the very open and complex operating system on offer. Combined, Android 8.1 Oreo, along with Samsung Experience and security platform Samsung Knox, deliver a rapid, secure mobile and computing environment, which hopefully will only be added to in terms of speed and security when the Note 9 gets its inevitable Android 9 Pie update in a few months time. Fortnite is a launch exclusive for the Note 9 and certain other Galaxy devices. A key piece of gaming software on the Note 9 is the launch-exclusive Fortnite third-person online PVP shooter by Epic Games. Fortnite is playable now on the Note 9, as well as other Galaxy devices from the Galaxy S7 and up, and I can confirm that it shows off the gaming power locked into the phone very well, even if the install process to get there is slightly laboured by a non-Play Store standalone installer and patcher (I'd recommend checking for updates before you leave the house each morning, as otherwise your data plan is going to be destroyed). The bright and violent world of Fortnite is well shown off by the Note 9's 6.4-inch Super AMOLED screen, which also gives you plenty of real-estate to control your character accurately, and runs smoothly on the Snapdragon 845 CPU with 6GB of RAM combo. Performance in modern, graphically impressive mobile games like DBZ Legends was very impressive on the Note 9. This slick performance was carried over into other graphically impressive Android games, such as Tekken, Final Fantasy XV Pocket Edition, and DBZ Legends. Now look, by this point most flagship Android phones run these games well, so the Note 9 certainly isn't in a league of its own or anything, but with its gorgeous, best phone screen in the world Super AMOLED display, along with its impressive Dolby Atmos-toting audio, it definitely delivers a zero-compromise mobile gaming platform. The Samsung Galaxy Note 9 is the best Android smartphone in the world. With the Samsung Galaxy Note 9 picture now fully viewable, I feel we are left with a device that is one of the very best Android smartphones in the world right now. And, that is despite the Note 9 dropping the ball slightly with Samsung's half-baked Bixby AI assistant and merely competitive, not standout battery. The Note 9 seems to have completed a transition from productivity powerhouse for work-orientated, smartphone enthusiasts, into simply a phone that excels across the board, delivering a piece of hardware that makes gaming, listening to music, and watching TV and movies, as well as mobile computing in all its forms, a no compromise experience. As such, if you can afford the Samsung Galaxy Note 9's admittedly high price point, I wholeheartedly recommend it. Which of these huge and beautifully designed phones is the best?